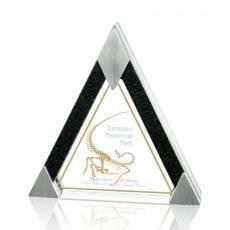 Pyramid awards evoke a timeless feel, a coming together of effort and success. 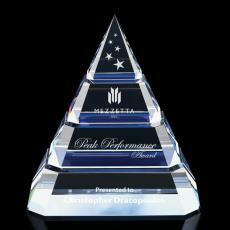 They point skyward, emphasizing the high expectations and soaring ambition. 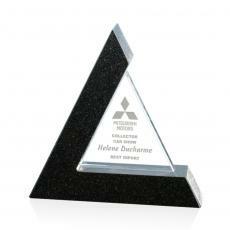 They can be as simple and practical as a pyramid paperweight or as elaborate as a crystal pyramid sculpture. 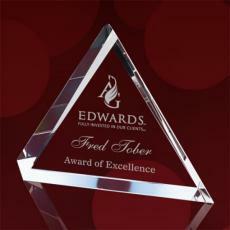 Each is a distinctive way to recognize achievement in the workplace or clubhouse. 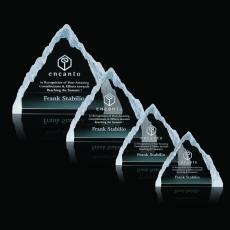 Pyramid recognition awards come in a wide variety of designs and sizes. 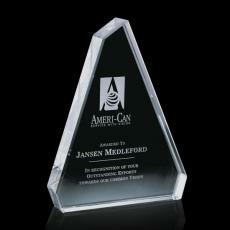 They can be made from crystal, acrylic, wood or metal. 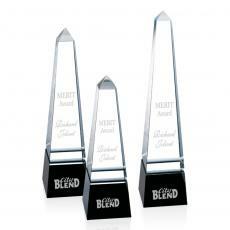 Crystal sculptures have an opulent look, with beveled edges and light shimmering from each tier. 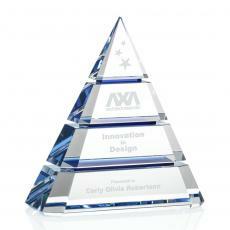 Affordable acrylic pyramid awards make excellent paperweights or stylish decorations for a desk or display case. 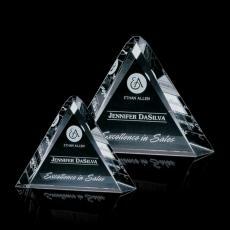 For a unique touch choose a prism pyramid that is made to reflect light. 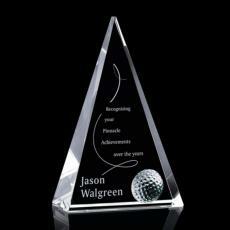 Personalized pyramid awards can be laser engraved with the recipient’s name and the reason for the award on the front. 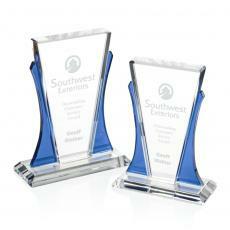 These give them special meaning and make them an treasured as a customized gift for years to come. 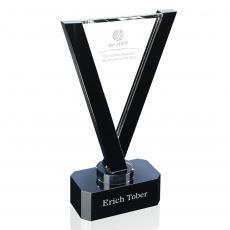 Every time the person who received it shows it off to a visitor, he holds in his hands proof that his efforts were appreciated by his colleagues. $39 - $56| Sizes: 6", 7" & 8"
$70 - $105| Sizes: 10"x10", 6"x6" & 8"x8"
$115 - $195| Sizes: 6.5"x8", 8"x9" & 9"x10"
$49 - $159| Sizes: 4.25", 5.25"x4", 6.5"x5.25" & 8"x6.5"
$110 - $250| Sizes: 10", 6" & 8"
$105 - $175| Sizes: 7", 8" & 9"
$170 - $250| Sizes: 2.5"x10", 2.5"x12" & 2.5"x8"
$56 - $119| Sizes: 3"x3", 3"x5" & 4"x6"
$160 - $240| Sizes: 10" & 8"
$98 - $124| Sizes: 6"x9" & 6.875"
$150 - $230| Sizes: 4"x10", 4"x12" & 4"x15"
$170 - $250| Sizes: 4"x10", 4"x12" & 4"x15"
$170 - $210| Sizes: 6.5"x9" & 7.5"x10"
$135 - $255| Sizes: 5", 6" & 7"
$35 - $68| Sizes: 2", 2.5" & 3"
$150 - $230| Sizes: 4"x10", 4"x12" & 4"x8"
$100 - $170| Sizes: 2.5"x10", 2.5"x12" & 2.5"x8"